The Browser lets you find and import various types of content into your projects, including audio and MIDI loops. The Browser’s Media tab makes it easy to find and import loops. You can preview audio and MIDI files before you import them into your project. 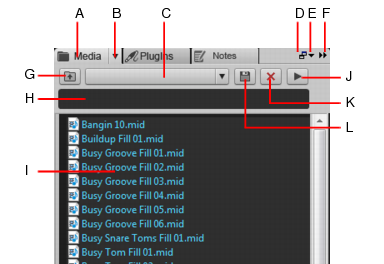 If you preview a Groove clip, it plays back at the tempo and in the key of your current project. Audio files can be auditioned through any bus and MIDI files can be auditioned through any soft synth. In the Browser, click the Browse Media button . Navigate to the folder that contains the file you want to import. To insert into an existing track as a new clip. Double-click the file to add it to the selected track at the current Now time, or drag the file to the desired location. Note: A new track is created if the file type is not compatible with the selected track. To insert into a new track. Drag the file to en empty space in the Track view, below the last track. To insert into a cell in the Matrix view. Make sure the Matrix view is visible, then drag the file to the desired Matrix cell. On the Browser menu, select Auto-Preview. On the Browser menu, point to Audio Preview Bus, then select the bus you want to preview audio through. Navigate to the folder that contains the audio content you want to preview, then click the file you want to preview. Note: Auto-Preview is enabled by default. If you disable Auto-Preview, you must click the Play button each time you want to preview the selected audio file. Tip: To preview an audio file as a Groove Clip, hold down the ALT key and click the file. To preview all selected files as Groove Clips, hold down the ALT and click the Play button . The Play button changes to a Stop button during preview. On the Browser menu, point to Synth Preview Output, then select the soft synth you want to preview MIDI through. Note: If there are no synths in the project, go to Insert > Soft Synths and insert the desired soft synth. Navigate to the folder that contains the MIDI content you want to preview, then click the file you want to preview. Note 1: Auto-Preview is enabled by default. If you disable Auto-Preview, you must click the Play button each time you want to preview the selected audio file. Note 2: MIDI Groove Clips loop indefinitely, but standard MIDI files play only once and do not repeat. For more information about the Browser, see Browser.